The C31 Live Line Indicator is designed for use upon overhead a.c. rail electrification systems operating at 25 kV nominal voltage to indicate the presence of extra high voltages to aid safe working practices. 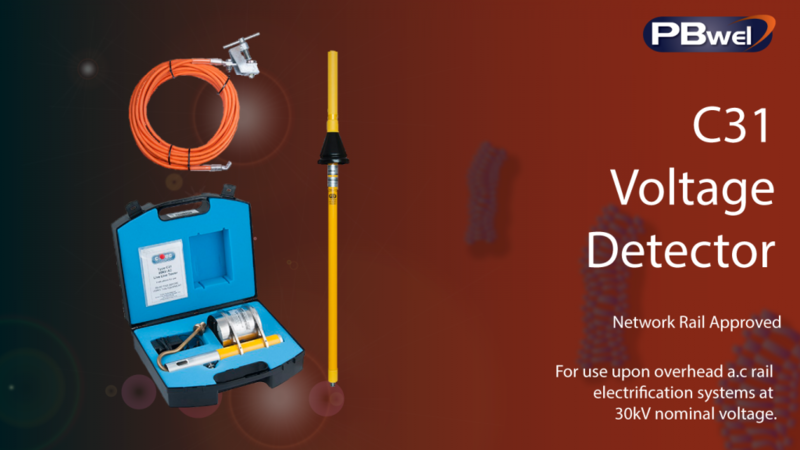 The C31 kit comprises the following: the live line indicator which comes in a tough protective carry case, a high voltage probe and hook – shrouded for use in wet weather – and an 8 metre length of 50mm2 aluflex cable with a rail clamp. Also included is a battery charger for charging the C31’s internal Nickel Metal Hydroxide batteries. The C31 Live Line Indicator incorporates a number of important safety features including; Dual independent circuitry, meaning the analogue meter and the LED indicators work completely independent of each other. If one circuit fails, the other will keep on working for your safety. Automatic ‘Meter Prover’ operates every time the tester is turned on, proving the electrical and mechanical operation of the analogue meter. Triple Resistor Sets ensure that in the unlikely event of one HV resistor failing, the remaining ones are sufficient to safely protect the operator and the equipment. The resistors are tested at 40 KV AC. The 50mm2 Aluflex grounding cable will safely conduct the full force of the OHL system in the event of a catastrophic failure of the equipment, such as direct contact with the overhead line. Automated Test Cert Validation, warning lights flash when test certificate has expired. For use upon overhead a.c rail electrification systems at 30kV nominal voltage. 12kV +/- 5% Threshold voltage. Compatible with standard Westminster operating poles and Primary Insulator pole.